Since the launch of Magerealm, most of the functions we designed were competitive and serious, and we feel it is time to add a function more fun and relaxing to the game. We hope the new function will bring balance to the game in terms of competitiveness. So here is is: Mage Poker! Players will get 3 free attempts daily, with additional attempts available for purchase. At the start of each attempt, players are dealt a total of 9 cards. Players should then separate them into groups of 3 into the 3 slots given. The cards in each slot will be compared with the opponent’s cards in the mirror slots. The combination of cards in descending order is thus: Set (3 of a kind)>Straight Flush>Flush>Straight>Pair>High Card. Each slot of cards that win will gain you corresponding items as reward and points, while losing will only gain you some participation points. Players get a minute and a half to choose their card combinations. If player fails to set his cards in the given time, the system will assign cards in random. Players will gain additional 100 points if they have either all sets, all flushes, all straights or four of a kind for their 3 slots. 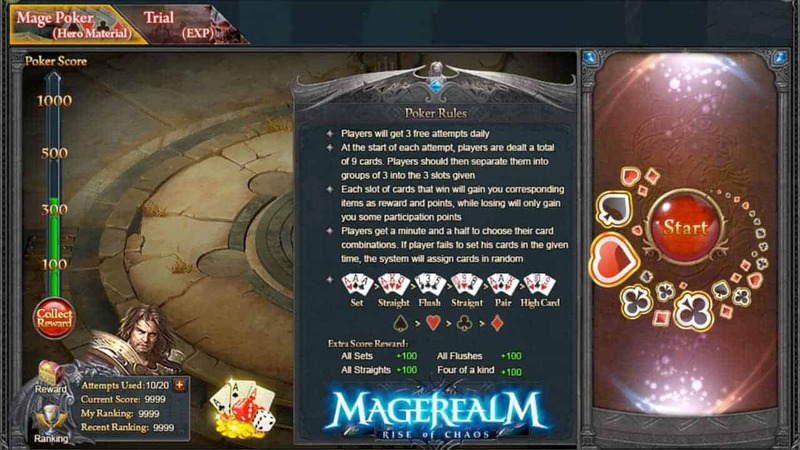 Players will also get the choice to peek their opponent’s cards and to let the system to change the cards they are dealt for great improvement in combination. One way we have envisioned that Mage Poker could tie in with the rest of the game is through the Pentacle Function. Heroes have played a crucial role in the game. Integral to the Hero System was the Pentacle Function that allows players to make their already powerful Heroes even stronger! However, Magerealm has found a way to make the function more fun and complex. We are introducing a new concept called: Star Vein, represented as five star icons on the corners of the original Pentacle. While the Pentacle stills functions like before, with players still able to level it up. However, Star Vein plays a more significant role in making a hero stronger. A Star Vein is activated each time players level up the Pentacle. Star Veins can increase a hero’s Growth Stat. Each Star Vein increase the Growth Stat by a set amount, but this amount increases with Pentacle Level. Players will be able to see the additional Growth Stats granted by the awesome Star Vein by the number in brackets behind the normal Growth Stat. Star Vein Badges are required to activate Star Veins. How do players get the afore mentioned badges? That’s right, from Mage Poker! We hope players would find the new function interesting and the concept easy to grasp. Please tell us what you think in the forum so we can keep perfecting your experience.